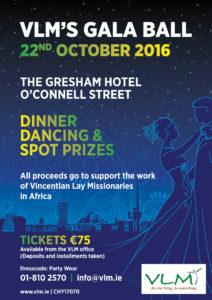 VLM’s Gala Ball is back by popular demand! It will be hosted at The Gresham Hotel, O’Connell St, Dublin 1 on Saturday October 22nd next. All returned volunteers, supporters and friends of VLM are welcome to join us for what promises to be a great night out and the social event of the year for all here at VLM. The event begins with a drinks reception from 7:30pm followed by a four-course dinner, music by The Jazz Freaks, spot prizes and dancing until late. Room rates are available at the hotel on the night. Dress code is party wear. Parking is available in Marlborough Street car park behind the Gresham. Tickets are €75 and can be purchased in advance from the VLM office. There are ten seats per table. Please transfer your payment into VLM’s bank account (below) with your name and BALL as reference to make your booking now. Please email us when you have made your transfer and include the address that you would like us to post your tickets to. Simples! Any questions – do not hesitate to get in touch at the numbers below. Contact Mary Anne for more info: info@vlm.ie / 01-8102570 / 087-1397069.